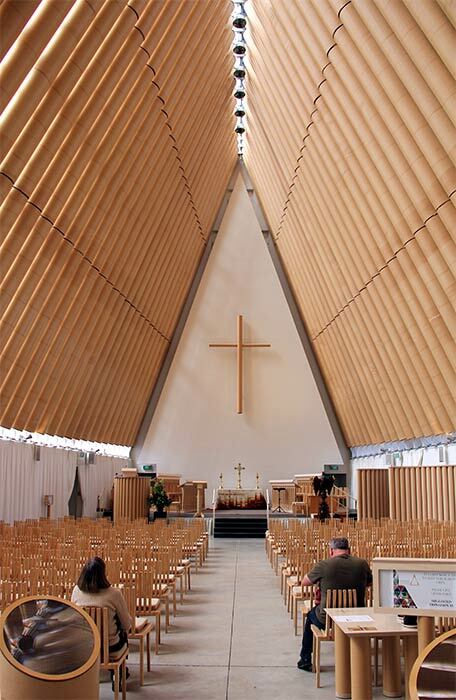 While the Anglican community of Christchurch waited for a decision on a permanent cathedral, this cardboard cathedral was built and opened in August 2013. It was designed by the Japanese architect Shigeru Ban, working with local firm Warren and Mahoney, and cost under $6 million. The building was constructed from 98 60-centimetre-diameter cardboard tubes. The site was previously occupied by the church of St John the Baptist, which was demolished following the 2011 earthquake.